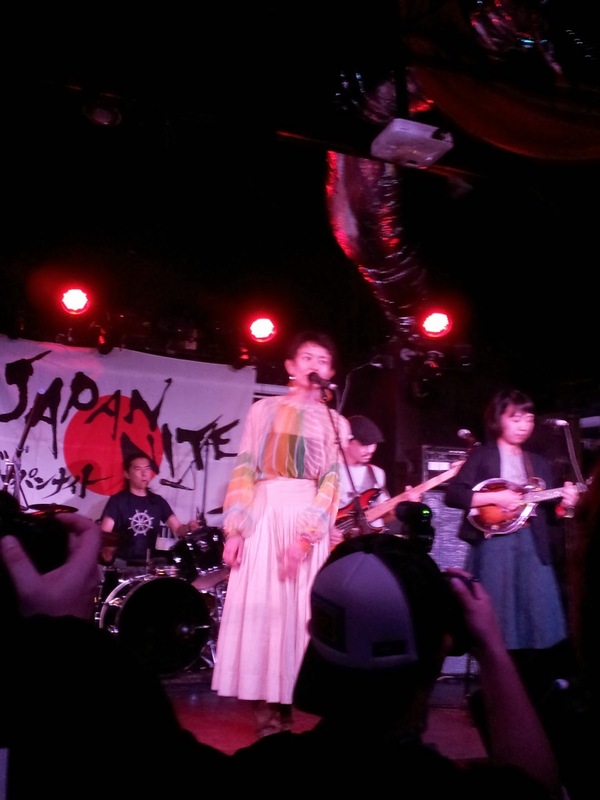 Japan Nite/ Live Report/ Mahoshojo-ni-naritai/ moumoon/ Pirates Canoe/ QUORUM/ Samurai Dynamites/ SXSW/ The fin. 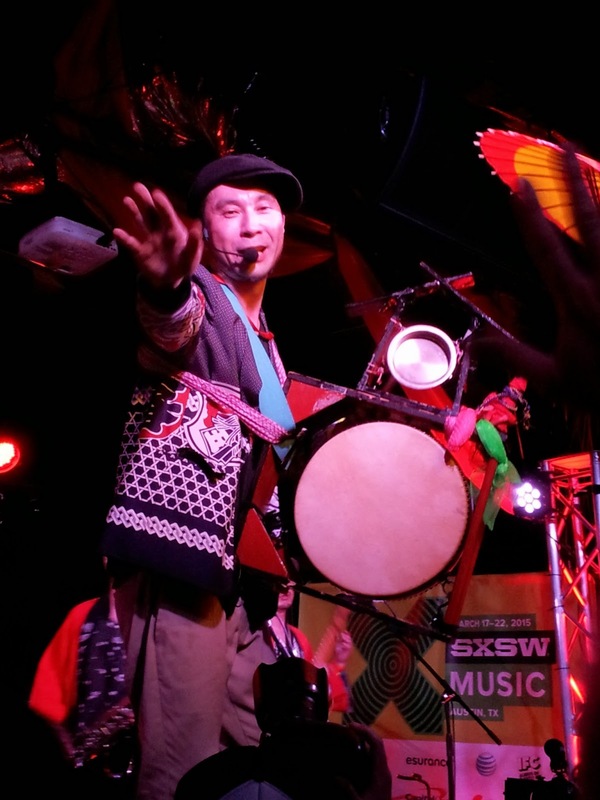 On March 20, one of SXSW’s resident showcases, Japan Nite, took over Elysium for their 20th year, hosting a crew of seven great bands from Japan that spanned every genre from hard rock to bluegrass. 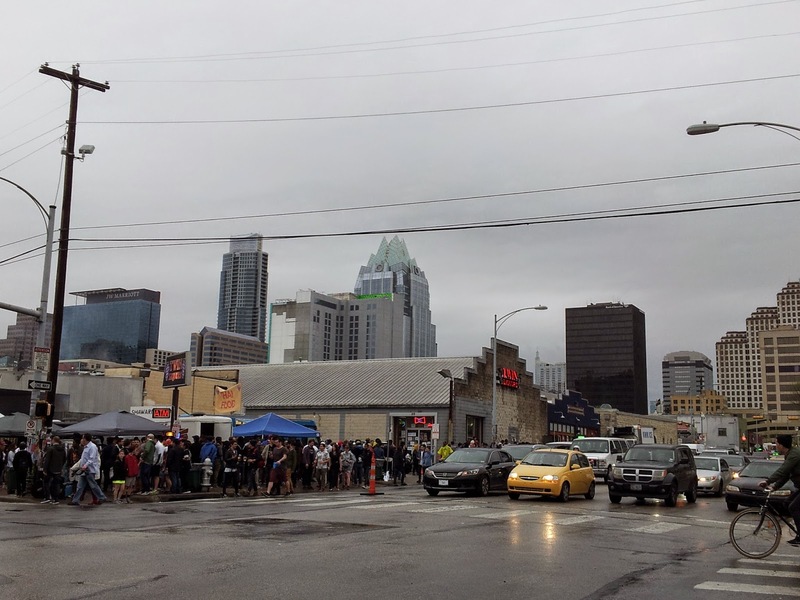 Despite the less-than-ideal weather conditions, there was a line down the block of excited patrons awaiting entrance, even chatting and interacting with members of the band as they came out to hand out flyers. Press passes are few and hard to come by, but I showed up anyway, armed with my trusty cell phone to cover the event as best I could. Mahoshojo-ni-naritai had just taken the stage as I came in and already had the whole crowd dancing. I have to say, this band was the biggest surprise of the bunch. When researching these bands, I never expected I’d end up headbanging to their set, but I found myself rocking hard as their electro-pop beats gave way to heavy-metal growls. Their high energy and dizzying sensory assault definitely set the tone for what would be a very unique showcase. Next up came Samurai Dynamites. Decked in happi coats and sporting and eclectic array of instruments, they filled the room with their ‘festival punk’ style. I heard someone in the audience describe them as “Gogol Bordello, but good” and I really can’t argue. The blend of European sounds with a Japanese aesthetic made for something truly extraordinary (where else can you see a fiddle player with his bow mounted on a katana hilt?). 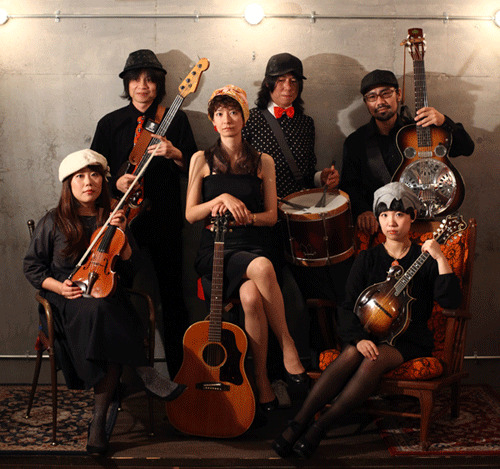 The wild energy of Samurai Dynamites was followed by the much gentler Pirates Canoe, a four-piece Americana band from Kyoto. There is something decidedly strange about seeing Japanese musicians playing American traditional instruments, but there is no denying their incredible proficiency. The mandolin and slide-guitar player elicited many a cry from the crowd with their solos and the group played a bluegrass cover of Lady Gaga’s Born This Way that brought the house down. I’m generally a rock and roll girl, but this band was one of the highlights of the evening and, no matter your genre of preference, I highly recommend checking them out. They kept the mood calm with the next act, The fin. I have to be honest here. Chillwave is just not my thing and I took this set as an opportunity to grab a beer. I found myself more interested in the GoPros mounted on EVERYTHING, than the band itself. They did, however, provide a nice break from the hectic atmosphere of the place, bringing everything down to a more relaxed pace as the crowd swayed and socialized. Not to disparage the band or their abilities, but this group is more background music than something you actively participate in. Next up was the epically surreal Moumoon. I find this duo a bit hard to describe. The music whipped from sweet and happy, to uplifting, to strange and almost dark. Vocalist, Yuka, appeared in a flowy white outfit, complete with white flowers in her hair, looking almost angelic as she swayed and jumped to the beat with a surprisingly powerful presence. She could have been singing about car parts and I’d have been right there with her. They had a fair amount of technical difficulties during their short set, but handled it with grace, finishing strong to grand applause. My absolute favorite act of the night was blues rockers, QUORUM. Prepare for some gushing, folks, because these guys absolutely blew me away. It’s been a long time since I’ve been this impressed with a band. Vocalist, Shintaro, knocked the doors off with his raspy yet powerful voice, reminding me of all the great vocalists of the 70’s. The guitar/bass combo was like nothing I’ve ever seen and their dueling solos were hands down the coolest thing I’ve witnessed in nearly a decade. This group would fit seamlessly in your music collection alongside the likes of Lynard Skynard, Deep Purple, and Foghat. And I don’t say that lightly. I could go on for pages about this band alone, but the best thing I can tell you is CHECK. THEM. OUT. If you have the opportunity to see them live, DO IT. They will rock your face right off, guaranteed. 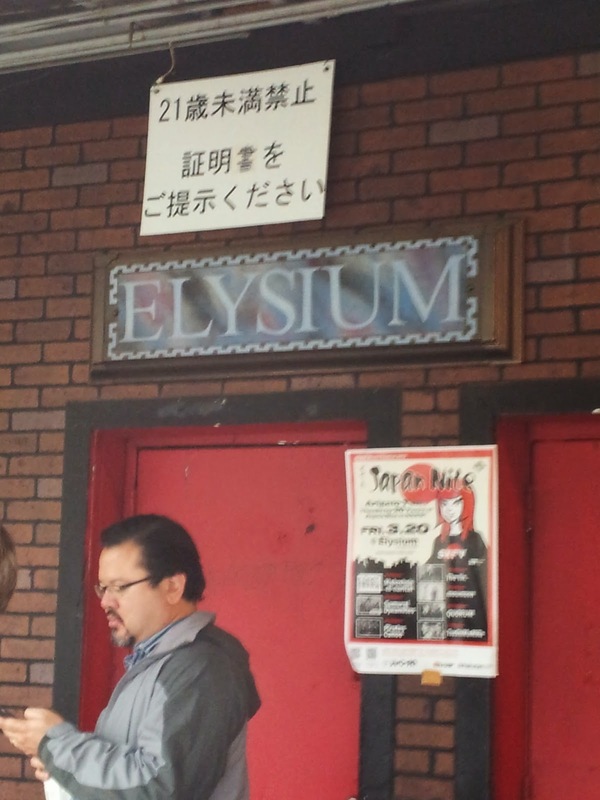 Unfortunately, I had to leave after QUORUM’s set (parking issues…thanks, SXSW), so I missed TsuShiMaMire, but from what I hear, they took the energy to another level. Apparently, there was crowd surfing. There are tons of clips up on YouTube from the show already, so check it out for yourself and tell me what you think. All in all, the 20th Anniversary of Japan Nite was a wild success. The bands that came out were a true testament to the talent and showmanship to be found in Japan and a perfect example of why I support their music the way I do. 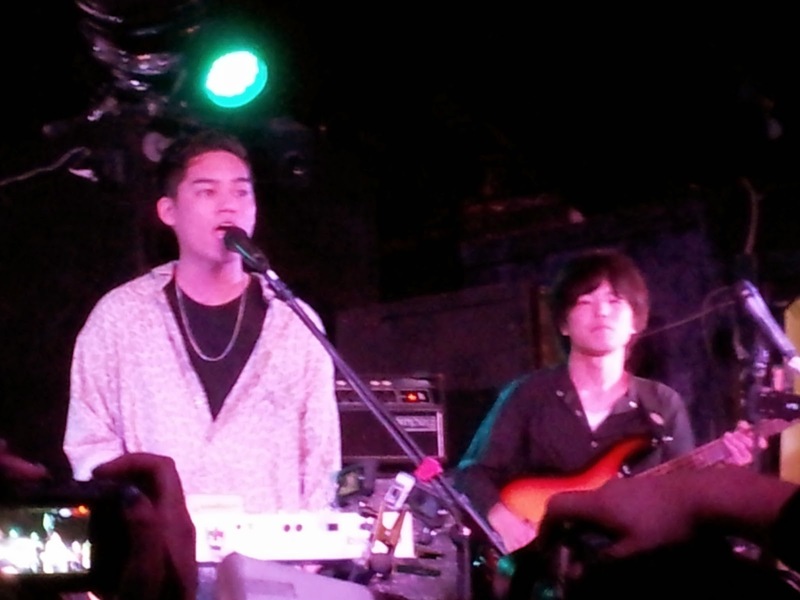 I want to thank Japan Nite for continuing to bring such amazing acts to our shores. Here’s hoping for another 20 years! It was Roman Hiko (Kome Kome Club). It has changed my life and still has influence to our band. I would love to go to Japanese restaurants in America. When we formed this band, it’s like we could be broken up with everybody’s widely varying opinions on every matter because of the difference of our ages. We have more and more time together to do thing as a band and now forget to think about breaking up. 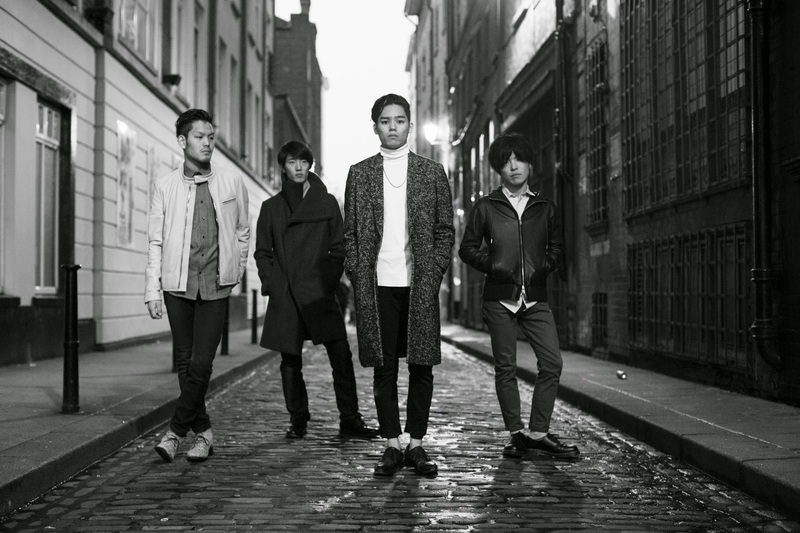 Our plan is performing at Tokyo Olympic….. I would bring a book, since no electricity there. We would like to tell the world Mahoshosho-ni-naritai is going to be a Japan’s new culture and we are looking forward to meeting new fans in the USA. 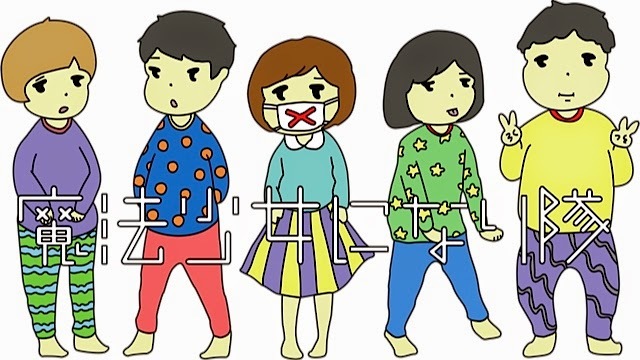 Special thanks to Adult Yu Kun of Mahoshojo-ni-naritai and Audrey Kimura of Benten.